Make your next Corporate Event a creative one! Muddy’s Studio is the ideal place to provide a fun, relaxing, unique and creative experience for your business event or holiday party. Your event can feature wheel throwing or hand building or a combination of both. 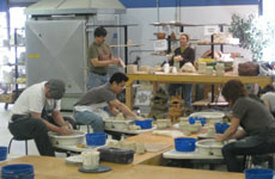 Muddy’s Studio will provide professional instruction, clay, materials, tools, and firing. A day, or evening, working in the studio together becomes a memorable holiday party. What could be more fun then being with a group of your best buddies and creating art? Here at Muddy’s Studio, we will inspire you to be creative, to become an artist and to use your imagination. Parties include instruction, tools, clay, glaze and firing. Muddy's Studio also offers private, semi-private and group lessons tailored just for you. 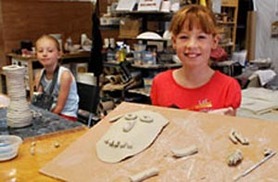 Choose wheel throwing or clay sculpture/hand building and Muddy's will provide you with an exceptional and unique artistic experience that is fun for everyone. Kevin A. Myers has been a ceramic artist for over thirty years. With his guidance, you can create a beautiful hand built sculpture or sit down and learn the basics to wheel throwing. Kevin will encourage each student to create a one-of-a-kind piece of art. 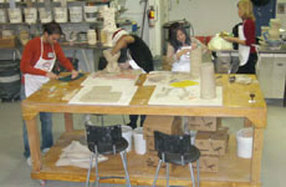 Classes include as much clay as the student needs (up to one 25 lb bag), tools, aprons, instruction, equipment, firing and glaze application. After the lesson is over you may stay and use the studio for another one and one half hours to practice your new skills.